Most scholars who work with Ælfric’s Lives of Saints agree that it is time for a new scholarly edition. The current one, edited by W.W. Skeat, is inadequate for a number of reasons. At our session at ICMS 2012, a number of scholars expressed interest in having a new edition that was based on modern editing standards and made use of contemporary tools. It is clear that such an edition will be a collaborative effort. in that vein, this session will bring together interested parties to present concrete problems, solutions, and ideas with regard to editing and building a new Lives of Saints. Please send abstracts of no more than 200 words describing your proposed involvement in this roundtable to Grant Simpson (glsimpso@indiana.edu) by September 15th. Keep in mind that we’d like it to be a working session in the sense that we’d like to get to the bottom of what needs to be done and how we should go about accomplishing it. I am pleased to announce the release of TEI Boilerplate 1.0, a lightweight solution for publishing styled TEI P5 content directly in modern web browsers. For more details, a demo file, download links, etc., please visit http://teiboilerplate.org/. TEI Boilerplate is open source and licensed under a Creative Commons Attribution 3.0 Unported License. Digital Medievalist will be holding elections in early July for four positions to its Executive Board. Board positions are for two year terms and incumbents may be re-elected. 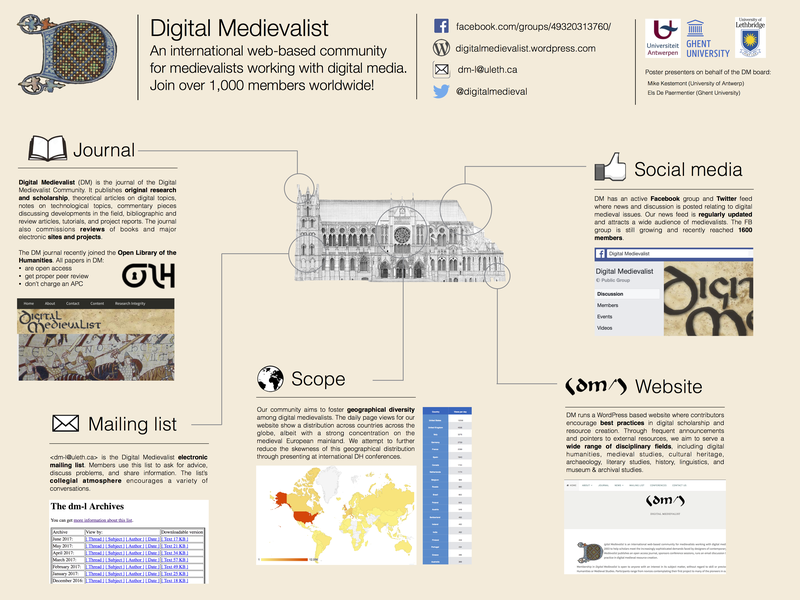 Members of the Board are responsible for the overall direction of the organisation and leading the Digital Medievalist’s many projects and programmes. This is a working board, and so if you are willing and able to volunteer time to helping Digital Medievalist undertake some of its activities (such as hands on copy-editing of its journal) then please take this into consideration when nominating yourself or accepting a nomination. We are now seeking nominations (including self-nominations) for the annual elections. 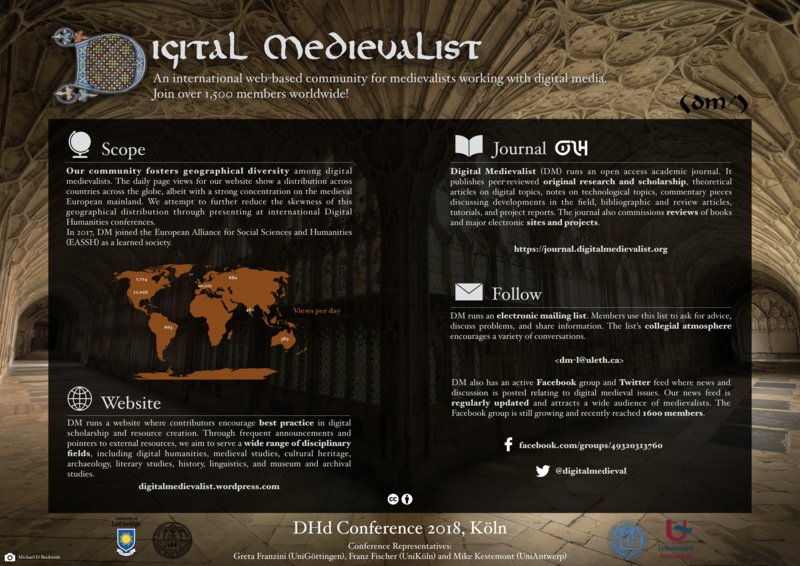 In order to be eligible for election, candidates must be members of Digital Medievalist (membership is conferred by subscription to the organisation’s email list, dm-l at uleth.ca) and have made some demonstrable contribution to the DM project (e.g. to the mailing list, journal, conference sessions, or the wiki, etc. ), or more generally to the field of digital medieval studies in some demonstrable manner. who will treat your nomination in confidence. Candidates will need to provide a short biographical statement of not more than 150 words. The nomination period will close at 00:00 UTC (midnight) on Monday 27 June 2011 and elections will be held by electronic ballot starting on Monday 4 July 2011 and ending on Friday 8 July 2011.